Way back in 1990, when I was an undergraduate at Washington University, trips home to Lima, Ohio were an architectural drag, from the point of view that there was little but amazing barns to look at. No modern architecture at all, and only a tiny bit of suburban detritus to study. I love barns, but there weren't that many of them. However, two buildings within a couple hours' drive popped up. Contemporary buildings by famous architects whose work I was studying. First, The Wexner Center. Yes, the building isn't a great art space, or even a great critique of art space, and it certainly has enough pastiche and bad detailing and bad circulation for an entire oeuvre complete. But it rocked my college brain having such a wildly absurd failure in gray Christmas-break-time winter Ohio. Second was Gehry's addition to the Toledo Art Museum, something between his later Bilbao-esque buildings with lead coated copper scales and his earlier 80s pomo-volumes-fracturing thing. Again, not so great building, but interesting having work by an architect I otherwise admire close by. It kind of fit Ohio to have average works by famous architects sitting semi-ignored in the middle of such a diffuse population. SANAA is about to change that. 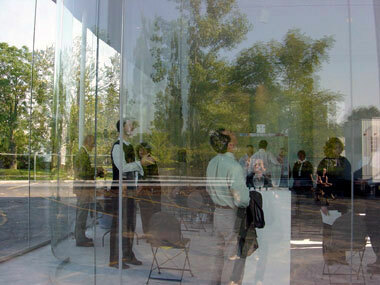 The construction photos of their glass pavilion for the Toledo Art Museum, as well as the mockup (pictured above) of the curved glass walls show a building that is both quiet and revolutionary. In Ohio. I get it.